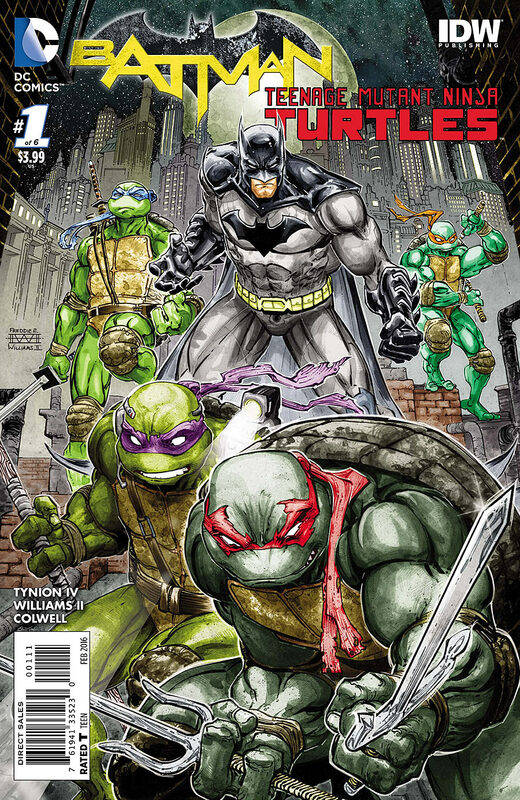 This Wednesday SyFyWriter revealed that Nickelodeon and WB will be releasing a Batman and Teenage Mutant Ninja Turtles crossover film direct to DVD. In 2015 James Tynion IV and Freddie Williams II crossed-over New 52 Batman with the successful IDW TMNT ongoing in a comic mini-series. That mini received a sequel, and inspired a crossover mini between the 2012 TMNT cartoon and Batman: The Animated Series. This upcoming movie will not be set in any one specific universe for either group of characters. Perhaps most compellingly is the inclusion of voice actors from all over both franchises’ histories. Just to name a few: Troy Baker who voiced Joker in Arkham Origins, and Batman in the Telltale Batman game (as well as every other video game character you can think of quite frankly) will be playing both Batman and the Joker. Tom Kenny will be voicing Penguin - thus reprising his role from The Batman animated series. Darren Criss returns as Raphael after having played him in the “Turtles Take Time (and Space) short. Eric Bauza, who has been voicing Splinter in the current “Rise of the Teenage Mutant Minja Turtles” series will be this film’s Leonardo. Rachel Bloom is playing Batgirl, and had previously voiced April O’Neil on Robot Chicken. Tara Strong is playing Harley and Ivy, Strong herself needs no introduction. John DiMaggio is playing Mr. Freeze, again another actor with a wide array of voices for both franchises. And Carlos Alazraqui, another voice acting legend will be voicing Bane - as he had done in Justice League Doom. One screen shot has been released, which really showcases how non-specific this universe will be. The classic blue and grey Batman with the oval, DCYOU Batgirl, and New 52 Damien Wayne Robin, mixed with very unique Turtles already has me very exited. The mixing and matching could easily lead to a very vibrant world. The film is set to release later this spring.